and next to silicon, ekasilicon. called argyrodite as it was known to contain silver. of a previously unknown element. Mendeleev thought it might be ekacadmium. Julius Lothar Meyer thought it was ekasilicon. to determine its physical properties. confirming the concept of element periodicity. Electronics built on it instead of silicon are faster. for high index of refraction and low optical dispersion. for airport security and gamma spectroscopy. however, the name was already given to an alleged element found in Tantalite. 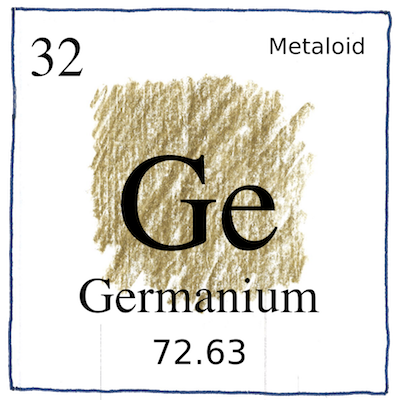 but Mendeleyev himself wrote Winkler that Germanium was a fine name. Clemens Winkler’s name for his own country was not “Germany,” but “Deutschland.” According to Peter van der Krogt, Winkler named germanium after the Roman’s names for the area they occupied, west and south of the Rhine, Lower and Upper Germania, and the area east of the Rhine, Greater Germania, whose people defeated the Romans in AD 9, establishing the Rhine and the Danube as the northern border of the Roman Empire.